In studying photographic composition, one of the lessons I have learned is to distinguish between the literal elements in a scene and the abstract elements. 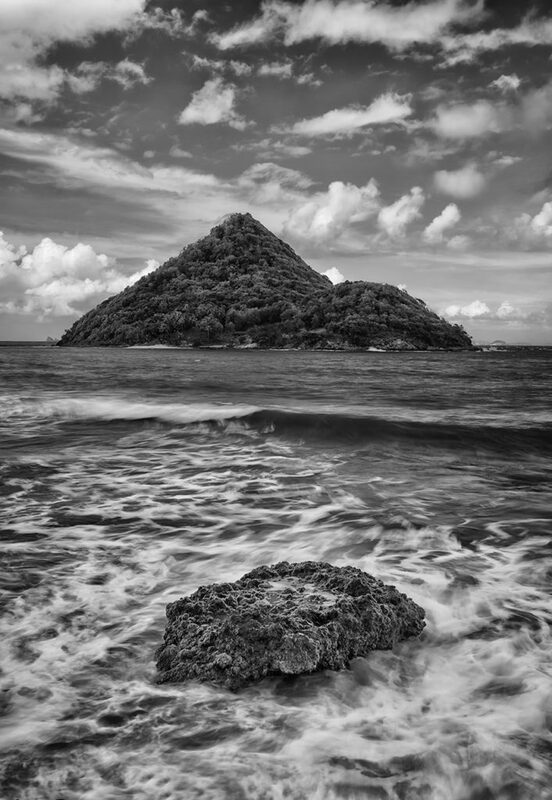 In surveying this scene – the tiny island of Sugar Loaf, shot from Levera Beach in the extreme northeast corner of Grenada, West Indies – I was contemplating the words of the late, legendary American photographer, Minor White. What was I looking at? A volcanic island and a rock in the sea: the literal elements. What would my camera see? A circle and a triangle, surrounded by space filled with the dramatic movement of sea and sky: the abstract elements. A great contemporary American photographer, Ian Plant, wrote in “Visual Flow”, his excellent e-book on composition, “Learning to see abstractly is critical to advanced image making and creating sophisticated compositions”. In preparing to photograph this scene, the words of both Minor White and Ian Plant were swirling around in my head and influencing my conceptualization of this image. Before setting up my camera and making the various technical decisions I knew would be necessary to produce a technically correct image, I de-focused my eyes, squinted against the bright Caribbean afternoon sunlight and made a conscious effort to deconstruct the scene to its most graphic, abstract elements: a circle and a triangle. In terms of composition, I placed the circle in the foreground in sharp focus in order to invite the viewer’s eye to come to rest there first, and the triangle in the distance, to draw the eye towards the back of the frame. Using a six-stop neutral density filter to slow the shutter speed, a low ISO of 100 and an aperture of f8, a Nikon 24-70mm lens at 36mm on a Nikon D800 camera body, the shutter speed slowed to 1.5 seconds, thus accentuating the dramatic movement in the waves and clouds.